A team of c. 20 MoLAS archaeologists has been carrying out the excavations as part of a massive and complex redevelopment programme on behalf of Land securities. The first phase of work (lasting 15 weeks) will end in early May. A second phase is anticipated in the autumn, and a third phase will start in spring 2009. In the Early Roman period, the site of 20 Fenchurch Street was probably occupied by a temporary fort, established to protect the city after the Boudican revolt. Later it lay close to the south-east corner of the second Roman forum, constructed in about AD 120. It was also a high-status area of the medieval City, serving as home to wealthy merchants. 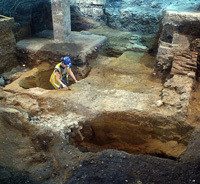 Victorian and modern basements and foundations have removed much of the archaeology on site, with only deep pits remaining from later periods. However, early Roman occupation is well-represented archaeologically by an abundance of surfaces, post pits, beam slots and other structural evidence from the first and second centuries. We uncovered three sides of a late Roman cellar in the centre of the site. It measured five metres north-south and more than seven metres east-west, with the eastern extent being beyond the edge of the excavation. We found over 2.5 metres of the cellar’s depth, but it was cut off at the top by the modern basements. Most of the masonry had been robbed out by people in search of stone after the cellar fell into disuse. However, the substantial ragstone foundations remain to show that it must have been part of an impressive building. To the north, the wall was dug deeply into the natural slope, forming a terrace behind it. We also discovered evidence of a possible stairway into the cellar from the north. The ceiling had been supported by a large square column base built of Roman bricks. It was floored with mortar directly onto the natural sands. We have no evidence for the building to which the cellar belonged or for what purpose it was used. Apart from pottery and building materials, the only associated find was a fragment of a decorated glass vessel with the letter “A” inscribed on it.